Since Sunday a series of Earth-directed CME’s have created Aurora Borealis visible as far South in these USA as, I hear, Arkansas! I know I will go out to look. Tonight, get out there if you have good viewing conditions, and look for the “Northern Lights“. They are events of terrible beauty, presaging we know not what. One of these days, friends, there will be a huge coronal mass ejection from your planet’s yellow star that strikes your planet square on. The result could be a vast electromagnetic pulse (EMP) which fries almost all your electronic stuff. You will be plunged in an instant back to something like the 19th century. Millions would die in these USA. Will you have what it takes to survive? On the other hand, there could be nuclear attacks that cause EMPs, or perhaps there will be a pandemic or other natural events which brings down the world’s economy, resulting in much the same chaos. I remind you to reflect on what could happen to us if there were another Carrington Event. This last Coronal Mass Ejection was Earth-directed. If it were larger… we could be in deep problems RIGHT NOW. More auroras are in the offing as Earth’s magnetic field reverberates from the CME strikes. NOAA forecasters estimate a 90% chance of polar geomagnetic storms on June 23rd, subsiding only a little to 70% on June 24th. X-ray and UV radiation from the flare ionized the upper layers of Earth’s atmosphere, causing a blackout of some shortwave radio signals over North America (blackout map). Mariners and ham radio operators, in particular, may have noticed disturbances at frequencies below ~20 MHz. The explosion also hurled a full-halo CME directly toward Earth: movie. NOAA analysts are still modeling the storm cloud to estimate its likely time of arrival. Best guess: June 24th. Sky watchers should prepare for more geomagnetic storms and auroras on Wednesday night. Perhaps, since I am getting into Ham Radio now, tonight I’ll watch that movie with Jim Caviezel… and I shift some ammo cans from storage! This entry was posted in "How To..." - Practical Notes, Global Killer Asteroid Questions, Look! Up in the sky!, Semper Paratus, TEOTWAWKI, The Coming Storm and tagged aurora borealis, Carrington Event, CME, Coronal Mass Ejection. Bookmark the permalink. 32 Responses to AURORA ALERT! Events of terrible beauty, presaging we know not what. If life as we knew it, Catholic life that is, were to be driven into the caves for the next 100-150 years, what would a Catholic go-bag consist of? I understand the basic survival requirements, but I am interested in such items as mini-doctrinal and catechetical books, bible, altar missal, Mass kits, aids for priests and instructional items for future priests, etc. The Faith survived in Japan for centuries after all. There is a beautiful shot taken by astronaut Scott Kelly of the aurora borealis appearing red as viewed from the International Space Station on June 23. It’s near the bottom of this series of photos. correction: His photo was taken June 22. Just in time for St. John the Baptist’s Day! Unfortunately, I don’t know of any patristics quotes about the Northern Lights. They were mostly a low latitude bunch of guys. No wonder1 My husband and I saw an unusual rainbow ESE about 630 PM MST (AZ is not on Daylight Savings) and low clouds with a straight demarcation. Very unusual. We woke to our usual horizon to horizon blue skies. An EMP will take out all electrically run devices. In 1859 telegraphs were taken out, as that was the only electric thing around. It will all fit into a backpack. As far as priests are concerned, formation can begin again when we achieve a sense of normalcy. The above will allow you to keep and evangelize while the disaster is taking place. After said EMP I just hope we get to learn about WDTPRS via short wave radio! So, I’ll be pointing my antenna East in Fr. Z’s direction. If the IRS can keep sending us tax bills, then Fr. Z should certainly be able to get his excellent Catholic commentary out also. Greenlight, if you go to The Captains Journal, captainsjournal-dot-com, (I don’t want to insert a hot link), and look for TCJ BY TYPE. Scroll down to Disaster Preparedness (2); go there and read the article, plus the other four linked at the bottom. Viva Christo Rey! SCOTUS ruled that the government can’t confiscate your property, in this case raisins, for less then their value. I’m wondering if this might not lead to a surplus of raisins! Think of this, you peppers, when you are squirreling things away to rebuild and maintain the practice of our Faith after TEOTWAWKI. Wine valid for Mass can be made from raisins. “Here are some questions I’ve never heard answered: What does the “frying” part actually entail? Let’s say I’m driving home when the CME or EMP hits. Does my car just stop working? No. 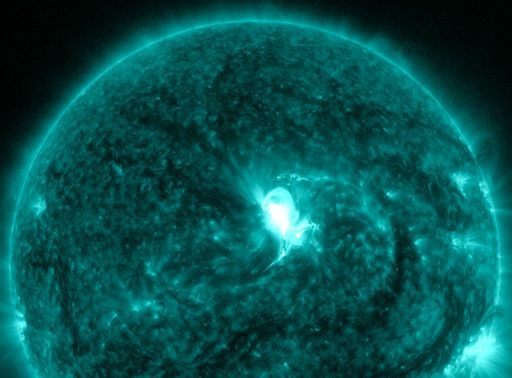 Geomagnetic storms such as from CME’s produce strong but relatively slow changes in the magnetic field that primarily affect long conductors, particularly on the order of miles. Your car will be just fine during a natural event. A nuclear EMP can generate a more rapid pulse that can potentially damage shorter conductors such as in your car, but over much smaller areas. Of course, when we talk about a nuclear EMP, we’re effectively talking about China or Russia trying to commit economic suicide. A large EMP attack by rogue nation like North Korea or terrorist group is purely fiction. They have neither the nuclear nor the rocket technology to pull it off. Maybe, at electrical substations, for a severe geomagnetic storm. Will it be able to be fixed if/when things get up and running? Yes, but it might take time. The most significant geomagnetic-related disruption of the last century knocked out power over a large fraction of Canada, but the outages were overwhelmingly due to safeguards built into the electric grid successfully shutting the grid down to protect the physical infrastructure. Most of it was back up the same day as the storm subsided enough to allow the grid to be switched back on. There are conceivable scenarios where significant physical damage could occur, in which case repairs would become a matter of prioritizing critical infrastructure and large cities. On hand spares could fix some portion of the grid in days, ensuring power to emergency services. Examination of in-service equipment would allow swapping parts around to bring more of the grid online over weeks to months. Some areas could potentially be offline or allowed only limited power for months. So we’re talking about effects potentially more disruptive than Hurricane Sandy, and covering a larger area. In that event, it was nearly 3 weeks before power restored to all areas. In other words, potentially extremely serious, but still far short of the doomsday claims circulating the internet. If I manage to make it home, what about my wife’s car that was sitting in the tuck-under garage? Any chance it would work? What if I had a backup generator that was just sitting in a box? Could I just pull it out and fire it up or would it get fried too? No different than your car. Yes. Disconnecting from long conductors on the grid that can have large damaging currents induced in them reduces risk of damage, although the first level of protection your should have is surge suppressors on important electronics like your computer. Higher power equipment like your refrigerator can naturally absorb significantly more energy without damage…beyond the rating of most surge suppressors, to the best of my knowledge. They’re not impervious, but it’s definitely lower risk. Some of them were. They also ran for often dozens of miles with no grounding, no current limiting, and no means of isolation. Basically, they were far more vulnerable to damage than the electric grid of today, so it’s not a useful comparison to figure out how extensive the damage of an equivalent solar storm would be today. Our little parish will be fine. I live in the literal middle of nowhere, which won’t be so bad, in the event of a collapse of civil society, which will happen because we have thrown God and His Church out of the public square. I also keep a fairly large supply of beeswax candles at our church. Go to your parish and know where the stuff is. When the bad stuff hits, know where the Lectionary and Altar Missals are kept. Know where your book of blessings is. I redeemed the Fr. Weller traditional Roman Ritual and hid it from a semi-Marxist priest. Especially if you are like us where we do not have a resident priest. He drives 30 miles one way. That means lay leadership of the parish, and I have been president for a while now. I know where the key stuff is, and I have trained our parish council to know that as well. Christ will look after us, but as my Methodist grandfather used to say: God helps those who help themselves. If we are in for a persecution, you need to know where to find/hide those articles of the faith in order to preserve them. Above all, don’t let your faith be shaken. Be strong. You will become the light of the world. I spent my post-military career as an electrical engineer working in nuclear power plant operations as a senior reactor operator, including switchyard operations. The major threat from a massive CME is not that it will “fry” your iPhone or HDTV or digital watch. It won’t. The real problem is the damage that could occur to the massive main power transformers found at every generating station and to the somewhat smaller transformers at substations found everywhere throughout the grid. Prepartory engineering, manufacturing, and replacing just one main power transformer can take the better part of a year under normal conditions…and requires power. Each generator at a power plant uses three. Damage is far from a certainty, but where it occurs will remove that power station from service and be extremely difficult and long to repair. In the case of nuclear units, the highest priority during a generalized grid loss is assuring electrical power to reactor core decay heat removal system. On the subject of some sort of personal religious archive, the issue is nonsense unless one has such material only in a form that requires power to use. Paper does not. These lists thus presented are deficient…the Liber Usualis and the King James bible should be near the top. In fact, Faraday cages are very Catholic – the Vatican used one in the Papal election of 2013 to prevent electronic eavesdropping. iamlucky13 has the rest of the analysis, above. At 42 degrees N, excellent seeing. besides glorious stars and one NE to SW meteor, half second duration, saw nothing. no aurora. I did find a Fathers quote finally! Thanks for the post iamlucky13. The Y2K panic has made me naturally skeptical of doomsday scenarios and the internet seems to incubate and amplify even the most outlandish events. Forgot to include in my original post that I’ve never seen an aurora before and hope to, some day. Also, need to get to confession. I don’t dig the SHTF talk very much, but completely agree on regular, solid confession. Lastly, I forgot to mention is that too much SHTF thinking leads, in my opinion, to excessive fear, which isn’t really healthy for Catholics. Faith and trust in God’s will, a willingness to cooperate with it, coupled with a healthy love for our real home will see us through any trial. For any sort of “rebuilding” I have lots and lots of Loeb books. I could make a medieval monk green with envy I have so many… And I’m planning on getting an English/Latin version of St. Thomas Aquinas’ “Summa” soon too. As for my personal religious stash… if a massive CME knocks out Western industrial civilization… I won’t need my copy of Laudato Si! Laudato Dominum! A CME would induce a current in any wires, the longer the wire, the stronger the current. The resulting current would not destroy all electrical devices, but would destroy most high voltage power lines(the transformers would fry). Since there is no supply of spare transformers, and there are only a few factories in the world that make them, all of which run on electricity that runs through high voltage power lines, electricity would be down for most of the world for months to years. This would not be good for people who needed, say, refrigerated medication like insulin or gamma-globulin on a regular basis. Water treatment plants would go down, as would supermarkets. Gas stations depend on electricity to pump gas, so no refilling generators. All of this could be prevented by a simple addition to the high voltage transformers, which would be a re-purposed vacuum tube that would ground the lines if too high a current runs through it. The Second After is the best book to read on EMP. It brings into reality that the world can virtually change within one year. Hundreds of millions can die from lack of food and civil disobedience in just a matter of weeks. Think about it and then start your planning. I used to fancy myself as a “survivalist” type. I was trained by the Federal government in how to use Glocks, Remington 870’s, AR’s, MP5’s; basically, how to shoot REALLY WELL (I came in third in my class at Quantico). For a short time, I also stored MRE (meals ready to “explode”–for their laxative effect :), pinto beans, spam, lard, other dried goods, etc. I’m past all that now (for the most part). It’s still a really good idea to keep some provisions on hand, and firearms too (though keep them very secure, especially if you have kids). I think Katrina and Sandy taught us that dynamics can change very quickly in certain environments, especially urban ones. Of course, those who say, “the Rosary is enough” live in lala land–as the Knights of Malta fighting the Turks would have told you. But it was a mighty fierceness COMBINED with the Rosary which surely saved that small contingent from overwhelming odds. I am just curious as to the learned readership’s opinion — would it be considered morally wrong to note these and still not prepare? What if the end is nigh, and the writing on the wall is clear — would it be morally culpable to submit? To be perfectly honest, the notion of stretching my survival (I only am speaking for my self and not considering minors or others theoretically here) to a couple of weeks at most with all of this gear and protection is not necessarily something I wish to spend a great deal of time in the current life attending to. I could spend that precious time doing other things, things which may even assist whatever God’s plan may be for me once I make it (God willing and with prayers and perseverance and recourse to mercy and grace in the sacraments) to purgation…To be perfectly honest, if I compare the scenario of subsisting through a gun fight on rations and lake or river water with purification tablets to being taken to purgatory by Jesus, well…no offense to the present company but at this moment in time the latter is far more appealing to me. would it be considered morally wrong to note these and still not prepare? It would be morally wrong not to prepare anyhow — but keeping The End in mind. Thus my inclination, informed (I pray) by grace, is to avail myself frequently of the sacrament of Confession and otherwise to carry on with the duties of my station in life. If the latter need rework, then rework them I must, for in The End it doesn’t matter whether The End is nigh or not: Your End and My End, soon or late, are inevitable. I’ve long considered all forms of Apocalyticism, whether religious or secular or political or scientific, as a substitute for spirituality. In my lifetime, I’ve seen it in the New Ice Age (1970’s), Global Warming (oh sorry, “Climate Change”), Hal Lindsey (1980’s Countdown to Armageddon), Aliens (Heaven’s Gate), Y2K, the Mayan Calendar (2012), Apocalyptic Marian Apparitions, various prophets of the Rapture, Fundamentalism (Harold Camping), Chemtrails, the Million Man FEMA Army, NWO conspiracists, the Illuminati, etc. etc. All of it bunk. All of it a tremendous waste of spiritual energy. Like Fr. Z, I think Auroras are really really cool. But their only spiritual impact on me is a sense of wonder, that their Creator is really really awesome, that I am in His hands, and all will be well. It would be foolish to not prepare spiritually. IMHO if the Almighty determines it’s your time to go, prepared or not, you’re going…and if He has more work for you to do, prepared or not you’re staying. I don’t think this just applies to TEOTWAWKI. If you’re staying and keeping true to Him, He will provide. If you are thirsty, He will guide you to where there is good water; if you are hungry He will rain mana down from Heaven; if you need a little protein, stick out your hand and He will send a quail. He’s our Father who loves us and provides for our needs and delights in our delight. But, I’m with you. Given my druthers, I druther be Home.